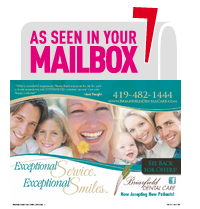 Exceptional Service and Exceptional Smiles! 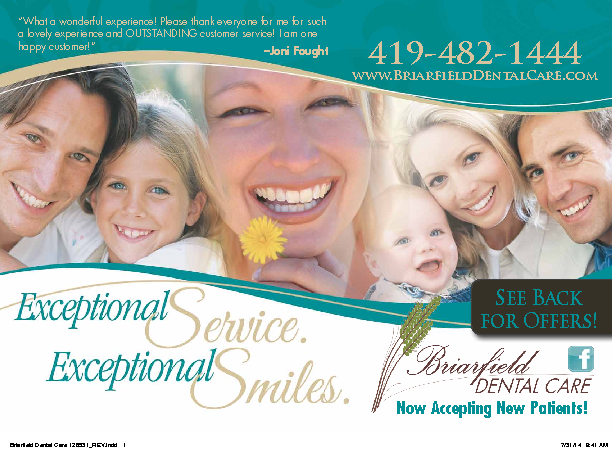 We want you to experience both here at Briarfield Dental Care. Check out our Get Acquainted Specials and current Promotions! New patients can take advantage of our Free Whitening Offer. Regularly $269, free with a paid exam, x-rays and cleaning at regular fees. With MANY insurance plans your entire visit may be FREE. Valid for new patients only. May not be combined with other offers. Transferable. Please share with your family, friends and co-workers! Includes a comprehensive exam, necessary x-rays, oral cancer screening, periodontal (gum) disease screening, cleaning and polishing. Valid for new patients only, X-rays are non-transferable, may not be combined with other offers. Transferable. Please share with your family, friends and co-workers! Includes a basic exam, digital x-ray and consultation or second opinion. May not be combined with other offers, discounts or prior purchases. Please share with your family friends and co-workers! Call us today and schedule a free consultation. Our $99 Brite4Life program was created to thank you for maintaining your dental health. For a one-time fee of $99 we will provide you with custom trays and whitening gel. Then, at each six month recare visit, we will give you a complimentary touch up kit of whitening gel. This ensures you will be able to keep your teeth bright and beautiful for life! May be combined with other offers!